Not too long ago, it was common for many real estate agents (especially in Contra Costa County) to routinely withdraw a listing after about 30 days and re-enter it into the multiple listing service (MLS) a few minutes later. They did so to reset the Days-On-Market counter to zero, thus giving the illusion that every home which showed only 5 days on the market really had just been recently listed. Back then, whenever I showed homes to prospective buyers in areas where this was a common practice, I’d always pull up a property history report for the homes my clients were interested in, so they could see how long the home had really been on the market. And unless their agent pulled such a property history report, hundreds of unsuspecting buyers would assume that a home that showed up as a new listing truly was fresh on the market rather than having been relisted in the MLS as New every 20 or 30 days. Thankfully, our MLS updated its rules a few years ago to prevent agents from “churning” their listings and misleading prospective buyers about the length of time the home had been on the market. Today, our MLS reports show two figures — Days On Market (DOM) and Cumulative Days On Market (CDOM). 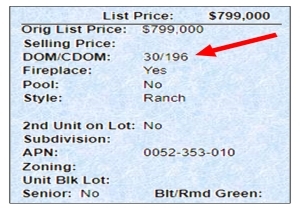 The latter is a field that was added several years ago, which shows how long a home has really been on the market, even if the seller switches brokerages, which will reset the DOM number back to zero. It was a change that was long overdue when it happened. Sellers loved the old way and many old-time real estate agents did, too. But today we live in an age where transparency is expected. And fortunately, buyers today don’t have to read between the lines. They can look at an MLS printout and see just how long a home has really been on the market. So if you’re looking a homes and feel a sense of urgency about a home that looks like it just came on the market, be sure to look at the CDOM figure…for that’s the one that really tells the full story.